An Elementary Classroom Teacher’s responsibility lies in preparing young students to excel in their education, especially in vital subjects, like Mathematics, Sciences, History, etc. On a typical Elementary Classroom Teacher Resume you can find job duties like implementing various educational procedures, co-creating curriculum for the students, managing various classroom functions, and assisting and supervising the students at all times when they are in their classroom. Some of the important qualifications required to take up this role are – love for being around students, strong educational qualifications, good and prudent decision-making skills, laudable knowledge in the happening educational trends, at least a basic computer knowledge, and most importantly good communication skills. Minimum education required for this role is a Bachelor’s Degree in Arts, Science, or Management. A Master’s Degree and relevant work experience are considered as added advantages for this job role. 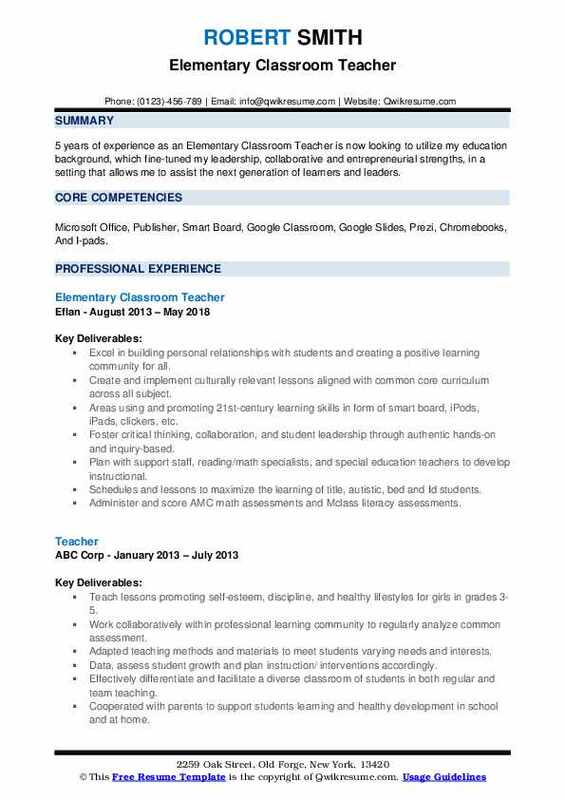 Summary : 16 years of experience as an Elementary Classroom Teacher is seeking to continuously improve my skills and abilities in order to best serve children in their mental and physical growth and development. 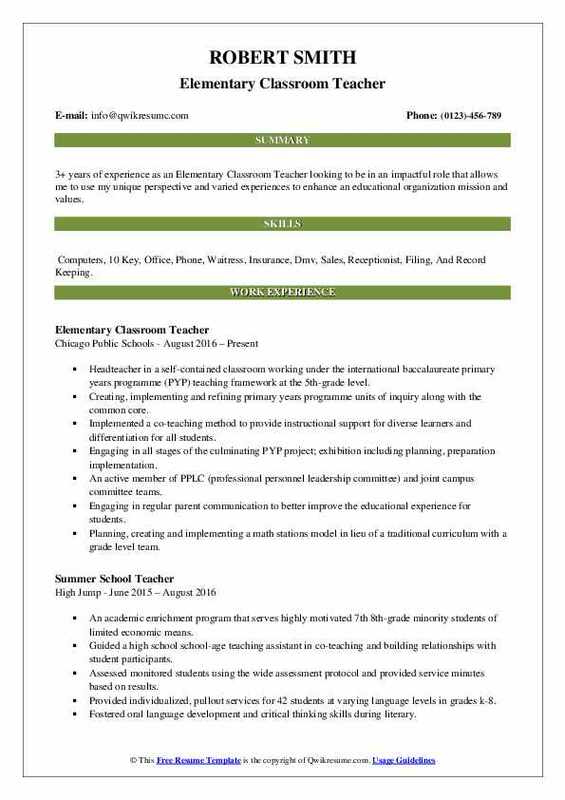 Skills : Curriculum Design, Professional Writing, Lesson Planning, Data Analysis, Student Assessment, STEM, Classroom Management, Team Leadership, Word Documents, Excel Spreadsheets, And PowerPoint. Guides the learning process so as to achieve curriculum goals and, in harmony with the goals, establishes clear objectives for all lessons, units, and projects to communicate these objectives to students. Employs a variety of instructional techniques and instructional media, consistent with the physical limitations of the location provided and the needs and capabilities of the individuals or student groups being taught. Diagnoses the learning disabilities of students on a regular basis, seeking the assistance of corporation specialists as required. 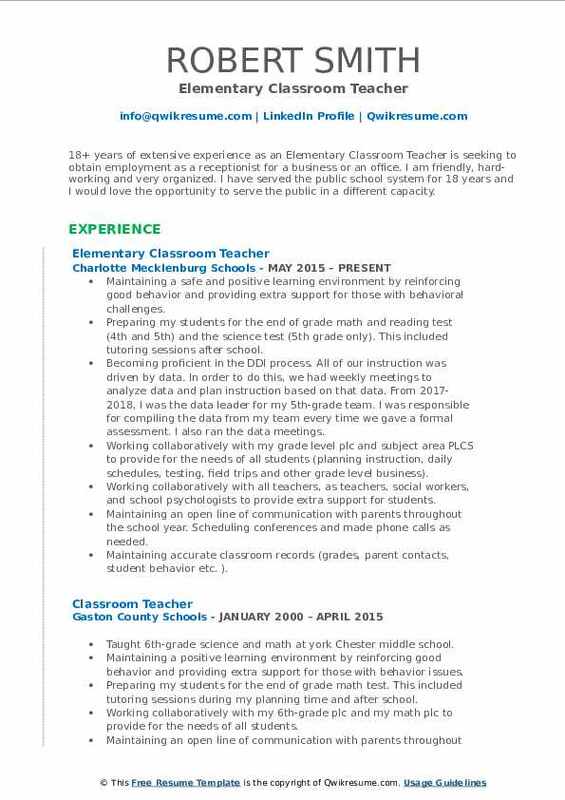 Objective : 5 years of experience as an Elementary Classroom Teacher is now looking to utilize my education background, which fine-tuned my leadership, collaborative and entrepreneurial strengths, in a setting that allows me to assist the next generation of learners and leaders. Skills : Microsoft Office, Publisher, Smart Board, Google Classroom, Google Slides, Prezi, Chromebooks, And I-pads. Excel in building personal relationships with students and creating a positive learning community for all. Create and implement culturally relevant lessons aligned with common core curriculum across all subject. Areas using and promoting 21st-century learning skills in form of smart board, iPods, iPads, clickers, etc. Foster critical thinking, collaboration, and student leadership through authentic hands-on and inquiry-based. Plan with support staff, reading/math specialists, and special education teachers to develop instructional. Schedules and lessons to maximize the learning of title, autistic, bed and Id students. Administer and score AMC math assessments and Mclass literacy assessments. 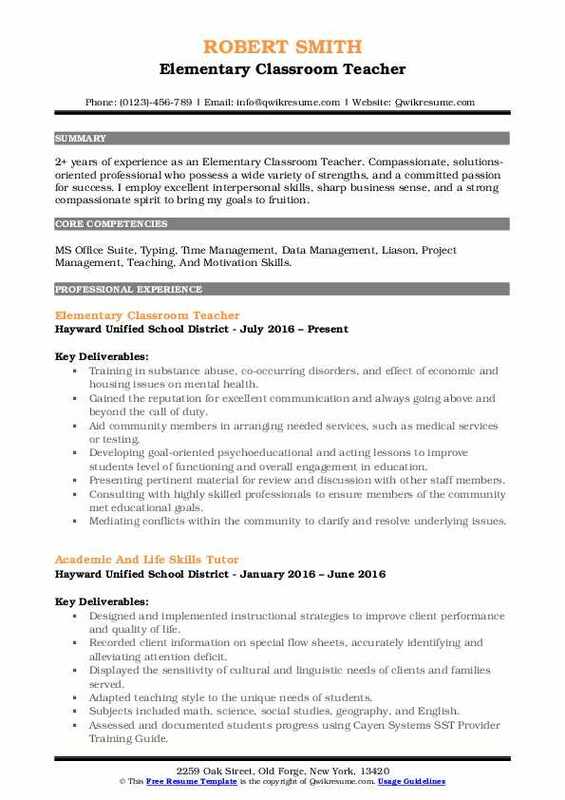 Objective : 3+ years of experience as an Elementary Classroom Teacher looking to be in an impactful role that allows me to use my unique perspective and varied experiences to enhance an educational organization mission and values. 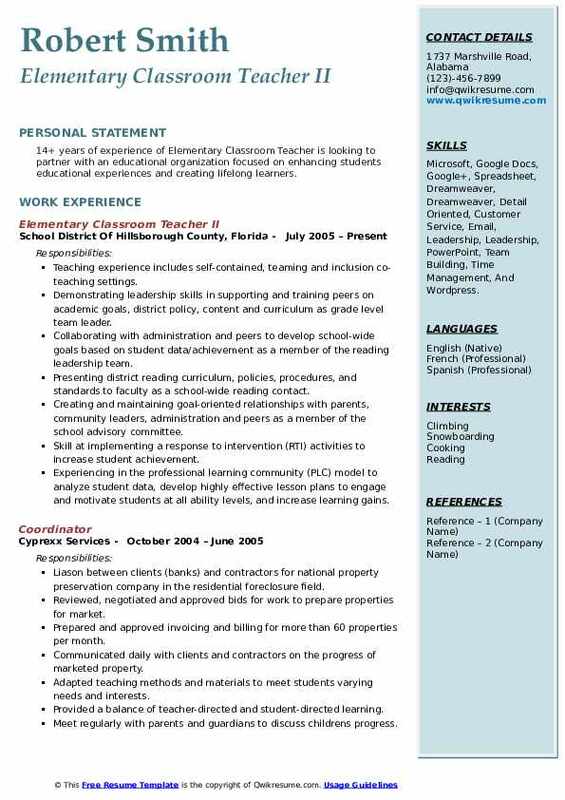 Skills : Computers, 10 Key, Office, Phone, Waitress, Insurance, Dmv, Sales, Receptionist, Filing, And Record Keeping. Headteacher in a self-contained classroom working under the international baccalaureate primary years programme (PYP) teaching framework at the 5th-grade level. Creating, implementing and refining primary years programme units of inquiry along with the common core. Implemented a co-teaching method to provide instructional support for diverse learners and differentiation for all students. Engaging in all stages of the culminating PYP project; exhibition including planning, preparation implementation. An active member of PPLC (professional personnel leadership committee) and joint campus committee teams. Engaging in regular parent communication to better improve the educational experience for students. Planning, creating and implementing a math stations model in lieu of a traditional curriculum with a grade level team. 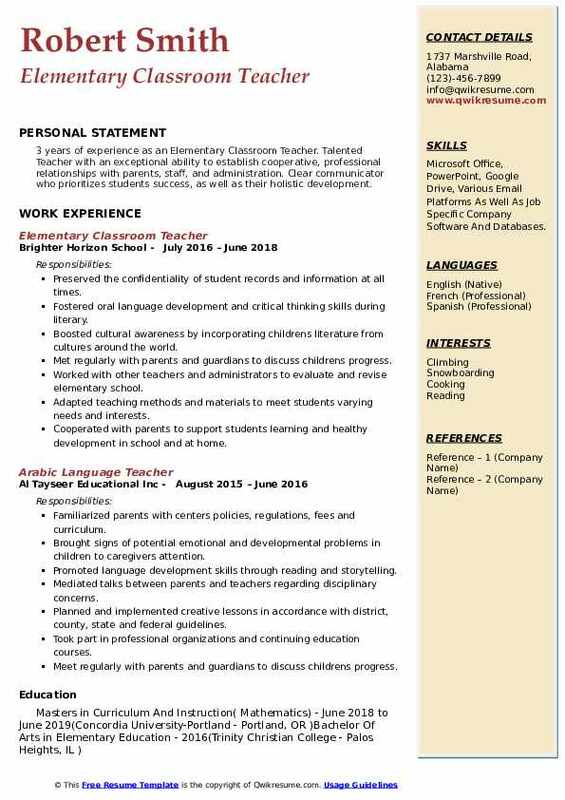 Summary : 18+ years of extensive experience as an Elementary Classroom Teacher is seeking to obtain employment as a receptionist for a business or an office. I am friendly, hard-working and very organized. I have served the public school system for 18 years and I would love the opportunity to serve the public in a different capacity. Skills : Filing, Record Keeping, Microsoft, Google Docs, Google+, Spreadsheet, Dreamweaver, Dreamweaver, Detail Oriented, Customer Service, Email, And Leadership. Maintaining a safe and positive learning environment by reinforcing good behavior and providing extra support for those with behavioral challenges. Preparing my students for the end of grade math and reading test (4th and 5th) and the science test (5th grade only). This included tutoring sessions after school. Becoming proficient in the DDI process. All of our instruction was driven by data. In order to do this, we had weekly meetings to analyze data and plan instruction based on that data. From 2017-2018, I was the data leader for my 5th-grade team. I was responsible for compiling the data from my team every time we gave a formal assessment. I also ran the data meetings. Working collaboratively with my grade level plc and subject area PLCS to provide for the needs of all students (planning instruction, daily schedules, testing, field trips and other grade level business). Working collaboratively with all teachers, as teachers, social workers, and school psychologists to provide extra support for students. Maintaining an open line of communication with parents throughout the school year. Scheduling conferences and made phone calls as needed. Maintaining accurate classroom records (grades, parent contacts, student behavior etc. ). 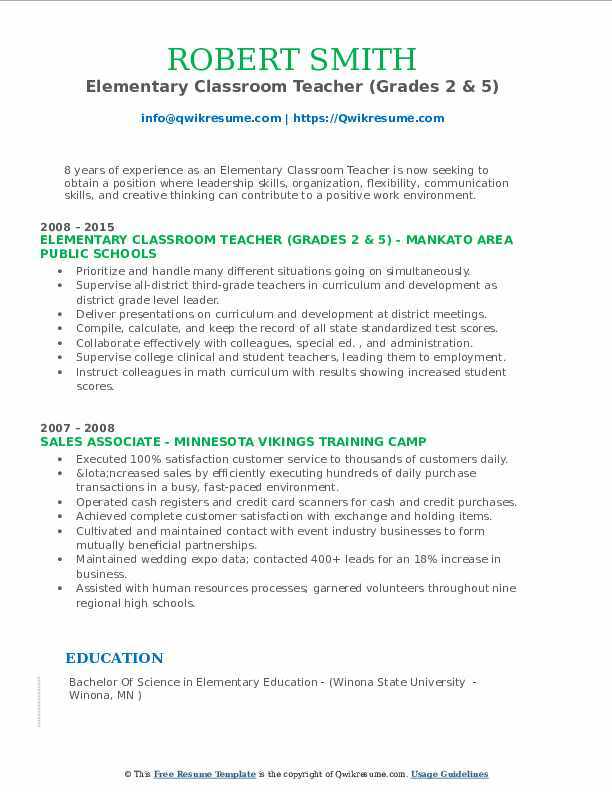 Summary : 14+ years of experience of Elementary Classroom Teacher is looking to partner with an educational organization focused on enhancing students educational experiences and creating lifelong learners. Skills : Microsoft, Google Docs, Google+, Spreadsheet, Dreamweaver, Dreamweaver, Detail Oriented, Customer Service, Email, Leadership, Leadership, PowerPoint, Team Building, Time Management, And Wordpress. Teaching experience includes self-contained, teaming and inclusion co-teaching settings. Demonstrating leadership skills in supporting and training peers on academic goals, district policy, content and curriculum as grade level team leader. Collaborating with administration and peers to develop school-wide goals based on student data/achievement as a member of the reading leadership team. Presenting district reading curriculum, policies, procedures, and standards to faculty as a school-wide reading contact. Creating and maintaining goal-oriented relationships with parents, community leaders, administration and peers as a member of the school advisory committee. Skill at implementing a response to intervention (RTI) activities to increase student achievement. Experiencing in the professional learning community (PLC) model to analyze student data, develop highly effective lesson plans to engage and motivate students at all ability levels, and increase learning gains. Aligning curriculum, instruction, and assessment of standardized benchmarks. Objective : 4 years of experience as an Elementary Classroom Teacher. Dedicated classroom teacher committed to creating a positive learning community with an emphasis on high expectations for academic achievement. Committed to providing differentiated instruction to meet the needs of diverse learners of any age. Skills : Problem Solver, Team Player, Time Management, Results-oriented, Strong Interpersonal, Professional, And Mature. Teach reading and writing (workshop model), word work (words their way), math (investigations), science and social studies. Utilize google classroom, read-write for Google, and a classroom website for communication with families. Use the SAMR model for integrating technology into instruction in a 1:1Chromebook classroom. Through district educator effectiveness program, was evaluated as an "effective educator" in all six teaching standards. Member of the core math project (through the University of Wisconsin-Milwaukee) to learn high leverage teaching practices to apply to my math instruction. Presented at the NCTMS mathematical proficiency for every student (MPES) conference, specifically about building procedural fluency from conceptual understanding. Student work samples and instructional commentary will be published in the May 2016 edition of NCTMS "teaching children mathematics" magazine. Summary : 8 years of experience as an Elementary Classroom Teacher is now seeking to obtain a position where leadership skills, organization, flexibility, communication skills, and creative thinking can contribute to a positive work environment. Skills : Customer Service, Microsoft Office, Volunteer, Excellent Communication, Teaching, Time Managment, And Illustrator. Prioritize and handle many different situations going on simultaneously. Supervise all-district third-grade teachers in curriculum and development as district grade level leader. Deliver presentations on curriculum and development at district meetings. Compile, calculate, and keep the record of all state standardized test scores. Collaborate effectively with colleagues, special ed. , and administration. Supervise college clinical and student teachers, leading them to employment. Instruct colleagues in math curriculum with results showing increased student scores. 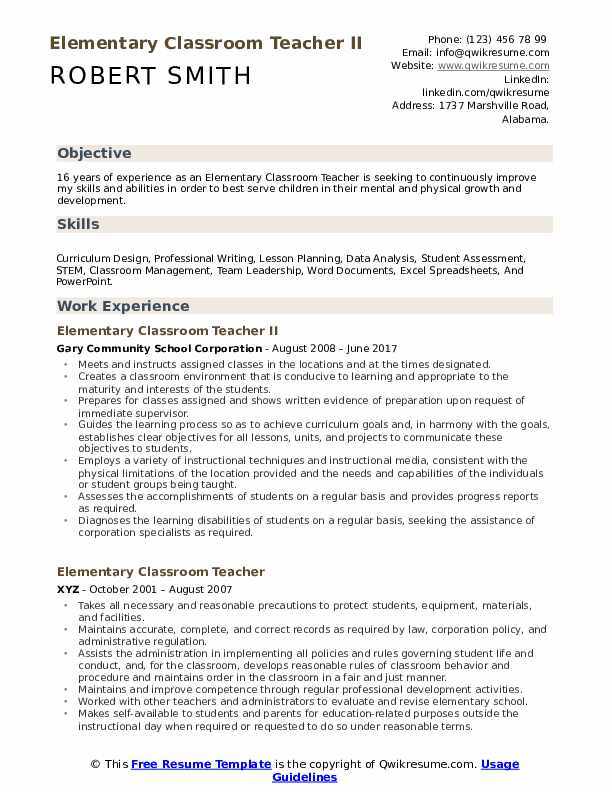 Objective : 2+ years of experience as an Elementary Classroom Teacher. Compassionate, solutions-oriented professional who possess a wide variety of strengths, and a committed passion for success. I employ excellent interpersonal skills, sharp business sense, and a strong compassionate spirit to bring my goals to fruition. Skills : MS Office Suite, Typing, Time Management, Data Management, Liason, Project Management, Teaching, And Motivation Skills. Training in substance abuse, co-occurring disorders, and effect of economic and housing issues on mental health. Gained the reputation for excellent communication and always going above and beyond the call of duty. Aid community members in arranging needed services, such as medical services or testing. Developing goal-oriented psychoeducational and acting lessons to improve students level of functioning and overall engagement in education. Presenting pertinent material for review and discussion with other staff members. Consulting with highly skilled professionals to ensure members of the community met educational goals. Mediating conflicts within the community to clarify and resolve underlying issues. 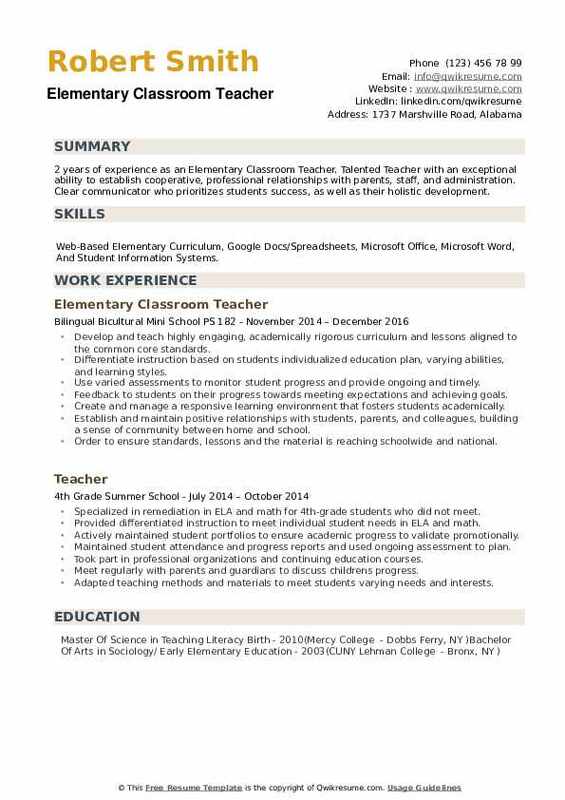 Objective : 3 years of experience as an Elementary Classroom Teacher. Talented Teacher with an exceptional ability to establish cooperative, professional relationships with parents, staff, and administration. Clear communicator who prioritizes students success, as well as their holistic development. Skills : Microsoft Office, PowerPoint, Google Drive, Various Email Platforms As Well As Job Specific Company Software And Databases. Fostered oral language development and critical thinking skills during literary. Worked with other teachers and administrators to evaluate and revise elementary school. Cooperated with parents to support students learning and healthy development in school and at home. 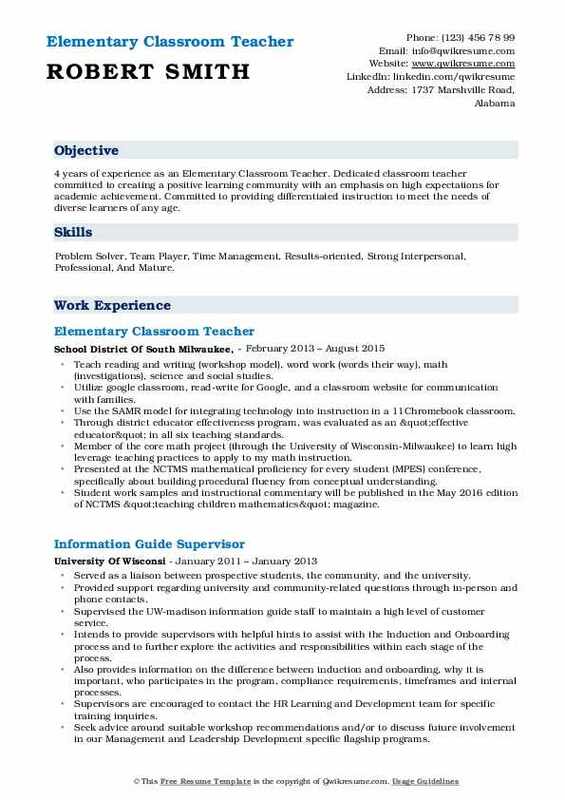 Objective : 2 years of experience as an Elementary Classroom Teacher. Talented Teacher with an exceptional ability to establish cooperative, professional relationships with parents, staff, and administration. Clear communicator who prioritizes students success, as well as their holistic development. Skills : Web-Based Elementary Curriculum, Google Docs/Spreadsheets, Microsoft Office, Microsoft Word, And Student Information Systems. Develop and teach highly engaging, academically rigorous curriculum and lessons aligned to the common core standards. Differentiate instruction based on students individualized education plan, varying abilities, and learning styles. Use varied assessments to monitor student progress and provide ongoing and timely. Feedback to students on their progress towards meeting expectations and achieving goals. Create and manage a responsive learning environment that fosters students academically. Establish and maintain positive relationships with students, parents, and colleagues, building a sense of community between home and school. Order to ensure standards, lessons and the material is reaching schoolwide and national.